The TE 21 was the penultimate Alvis motorcar ever built. Introduced in 1963, the TE 21 would be offered as a coupe or convertible (er, Drophead Coupe) through 1966. Production on the next model, the TF 21, would wind up in 1967 and Alvis pretty much just became a defense contractor after that. The TE 21 is powered by a 3.0-liter straight-six making 130 horsepower. These luxurious two-doors were sporty as well, with a top speed of about 110 mph. The body was based on a design by Graber of Switzerland but was massaged and built by Mulliner Park Ward of London. It’s a very attractive car. This early example was ordered off the 1964 London Motor Show stand and was used regularly through 1975 when it was parked. Rediscovered in 2008 by its current owner, this car was extensively restored and shows beautifully. Showing just over 40,000 miles, this is one of just 352 TE 21s built – and less than 100 of those were drop tops. It should bring between $93,000-$105,000. Click here for more info and here for more from this sale. 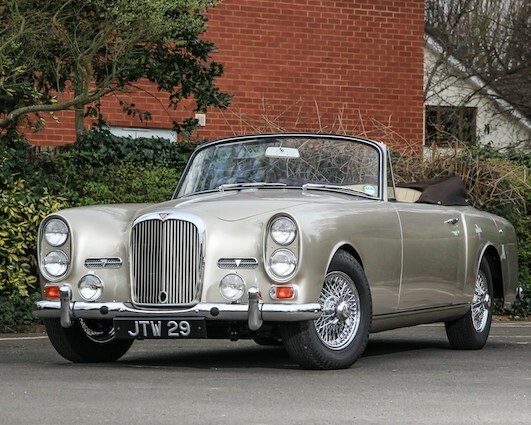 This entry was posted in Uncategorized and tagged 1964, alvis, auctions, cars, classic cars, drophead coupe, historics at brooklands, park ward, te 21 by classiccarweekly. Bookmark the permalink.